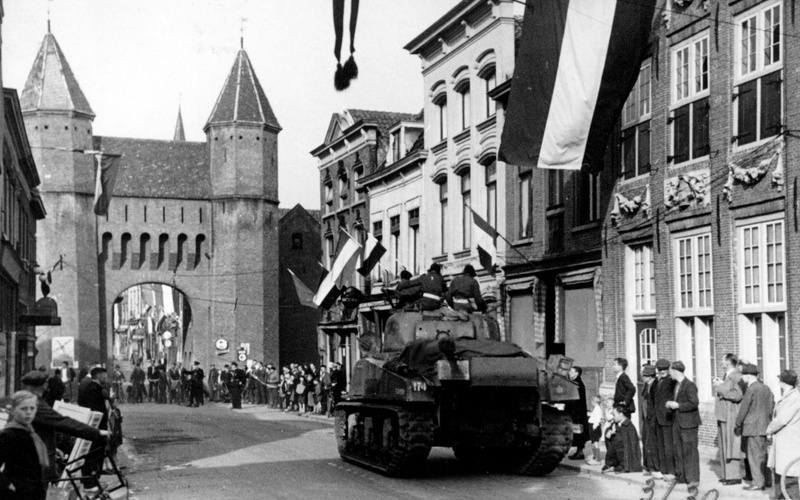 On Monday May 7th, 1945 the Canadian Allied Forces entered Amersfoort. The photo shows one of their tanks approaching the Kamperbinnenpoort. Unfortunately the tank is too large, so they have to make a turn left (source: archiefeemland.nl). Nationwide Dutch Liberation Day is celebrated on May 5th. On May 4th the victims of World War II are commemorated. It is nice to see so many happy people. In my country (Estonia), instead, on these days it started a long period of hell: the Soviet Union, until 1991. Estonians in the year 1945 were 97.3% of ethnic population in Estonia. In 1990, after 50 years of murders, deportations and settlement of new slavonic population, in Estonia there were only 61.5% of Estonians. I know, it's a tragedy! I was very happy when the Baltic states regained their independence in 1990/1991. What a happy day! When I was a kid, we always attended Liberation Day parades on Guam which is July 21.